Calvary Bible Church, 4001 Mountain Creek Road, will host a “Celebration of Life Service” for Mrs. Bee Austin on Sunday at 11 a.m. She died on Jan. 7, 2019, at the age of 98. “Miss Bee” was a lifelong resident of Red Bank. Mrs. Austin was raised on a farm off Ashland Terrace. She said there were only three houses in the area when she was born. Bee and her family attended the Red Bank Cumberland Presbyterian church. She trusted Christ at the age of 11 during a community revival of all the Red Bank churches. Bee started teaching Sunday School when she was 14. Bee and her husband Wayne joined about 40 others in founding the Hays Memorial Church on Easton Avenue in Red Bank. In 1969, Hays moved to Mountain Creek Road and became the Calvary Bible Church. The founding pastor was John S.
Lanham. 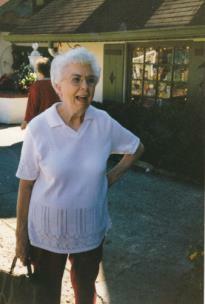 Miss Bee remained an active member of the church until her passing. She taught for many years the primary children’s Sunday School class. Bee was the “church home missionary” and regularly visited the sick in hospitals and nursing homes. She also was a member of the church choir. Miss Bee was known for her home cooked meals especially vegetables and cobblers. Gardening was one of her favorite hobbies. Miss Bee worked for Lanhams Bible Bookshop and was popular with the customers who would ask for her by name. She was married to Wayne Austin who worked for Southern Coach lines. The couple had three sons – Monty, Larry, and her special blessing, Terry. The celebration service will include stories from friends, family, and some of Miss Bee’s favorite songs. Pastor Dr. Bill Henry will deliver a message in honor of Miss Bee. Immediately after the service the church invites everyone to stay for lunch. Dr. Henry also welcomes those who cannot attend the service to come to the luncheon at approximately 12:15 p.m. Dr. Henry is urging everyone to bring photos of Mrs. Austin to share.